The Ideas, Inspiration & Insight You Need To Start Or Grow Your Photography Business! Your once-in-a-lifetime opportunity to grow as freelancer or small business owner. Be really quick – ONLY FIVE DAYS and it’s gone forever!! The craft of photography, for you, is more than a hobby; it’s a business. Managing and marketing your photography venture is hard work, but it can be a lot easier when you have the training, guidance, and education you need. 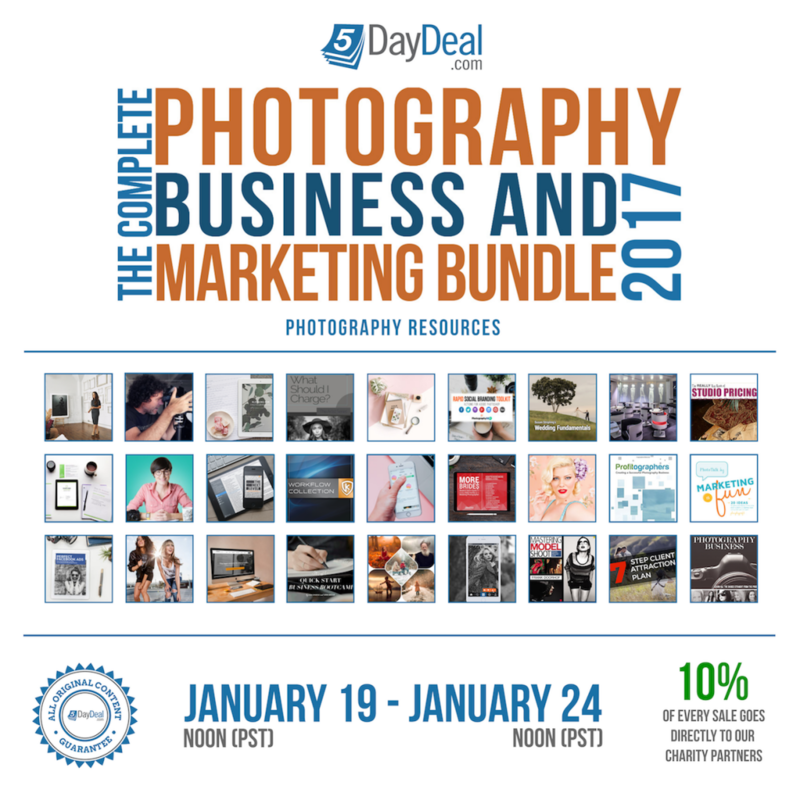 The 2017 5DayDeal Complete Photography Business & Marketing Bundle is a once-in-a-lifetime collection of video tutorials, eBooks, worksheets, and tools to help you kickstart or grow your photography career. Whether you’re doing it on the side or full time, your creative venture is the adventure of a lifetime. Learn how to build an exiting and successful photography business from industry professionals you trust. Invest in your photography business — invest in you. 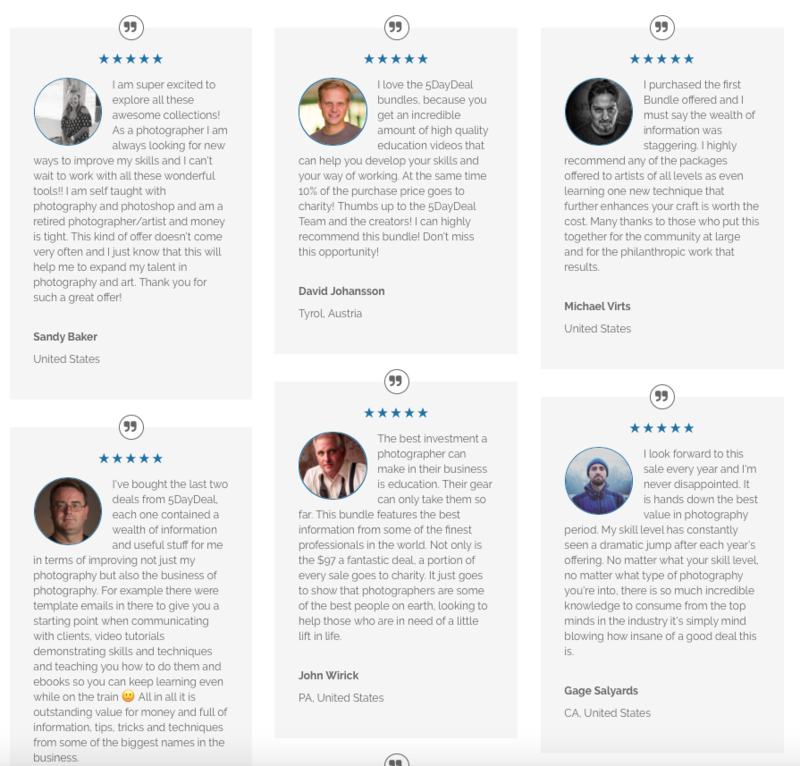 Learn how to build and promote a successful photography business. Organize your photography venture around the lifestyle you want. Create a web presence that engages your target market. Expand your income by establishing a stress-free sales process. Gain expert blogging skills and develop a passionate audience. Drive more authentic traffic to your website through social marketing. Develop inspiring goals that help your photography business thrive. Clarify your pricing and unique value without all the guesswork. Organize the legal side of creative work (without throwing up). Gain new referrals and retain your best clients more easily. Style and pose better portrait and lifestyle shoots. Feed your creative soul within the context of being a freelancer. Use the marketing tools and tactics that the pros use. Attract new and better clients that you’re proud to serve. Develop a manageable and exciting business plan. Inspire deeper inquiry into your talent by being more professional. Present yourself as an exiting alternative to your local market. Have an easier time dealing with clients (good and bad). Establish the offerings, services, and products that actually sell. Increase your fans and followers on Facebook and Instagram. Glad you asked. If the bundle wasn’t a sweet enough deal already, we also have several companies who have contributed discounts – like a bonus coupon pack. In the bundle information packet you will find all the information about the discounts including links and discount codes. Most discount codes will be live until November 30, 2016 (or longer) as noted on the discount page. Discounts are 1 per person and the company has the right to ask to see your 5DayDeal bundle receipt when you claim your discount. These are for exclusive discounts offered to 5DayDeal bundle customers only, so in this case, your kindergarten teacher is wrong. Don’t share! The download links will be good until November 30, 2016 (six weeks after the sale). We recommend you download all the products as soon as you can. Also, since this is a huge value and computers sometimes go nutty, we STRONGLY recommend you get a USB stick to save a back-up copy of your products. After November 30, 2016, it becomes much more difficult to get access to the files and we don’t want you to lose any of these amazing products due to a computer failure or other glitch sometime later. Another option is to back-up these products on google drive, dropbox or another online storage. WHAT IF I’M NOT HAPPY WITH MY PRODUCT? WHAT ARE PRICES LISTED & CHARGED IN? Great question. We are a US based company and all prices are in USD. You will be charged in USD and PayPal or your bank will convert baht fee over to your native currency if different. Immediately! As soon as your payment goes through you will be directed to a download page where you can get access to all the products either by download or instant registration. A few products do require a registration on the contributors’ respective websites. You’ll also be sent an email with download links and registration codes, so be sure to check your spam mail! Sale dates are between January 19th, 2017 at Noon PST until January 24th, 2017 at Noon PST. There will be no late sales and a sale with this combination of products will not happen again. That is dependent on your internet. We have zipped products in smaller files to help with downloads. If you have slow internet we recommend you download only 1 file at a time. The total size of all the files in the bundle is 29+ gigabytes. Additionally, a few products are available online. 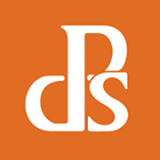 5DayDeal is run by Griffin & Valerie Stewart, Corwin Hiebert, and Daniel Dixon. The company is located in Nebraska, USA. You can learn more about us here. The best way to reach us is by e-mail by contacting us here.